Charlene was born July 28, 1936 at the family home where she lived in Lewis, KS. until her death on Jan. 16, 2019 when she left to be with her savior. The Daughter of Wayne Oran and Esther Marrion (Ary) Bell. She is survived by one brother John L. (Monty) Bell and wife Barb of Lewis, KS., one nephew Lance Bell and wife Cindy of Poplar Bluff, MO., one niece Aprily Oberkrom and husband Mark of Manhattan, KS. and five great nephews; Logan, Joplin, MO., Quinten and Rylan, Poplar Bluff, MO., Drake and Braxton, Manhattan, KS. 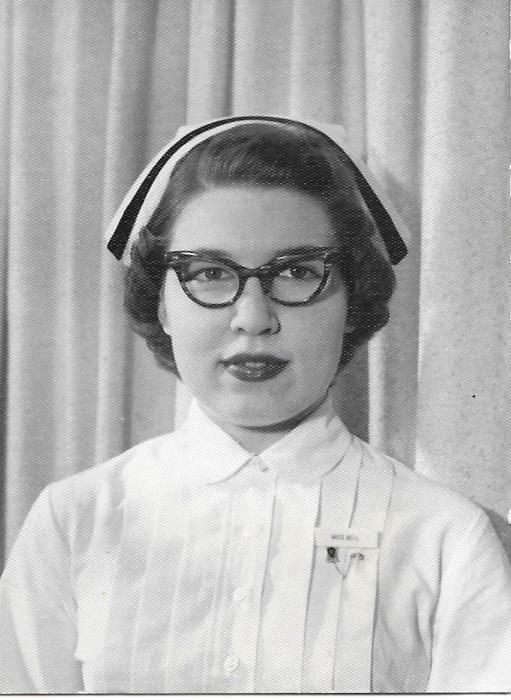 Charlene graduated from Lewis High School in 1954, and Grace Hospital School of Nursing in 1957. She worked as an RN at the Edwards County Hospital from 1957 to 1962, when she entered Baylor University School of Anesthesia at Dallas, TX., Graduating in 1964. She was employed at the CKMC in Great Bend, KS., as a Certified Registered Nurse Anesthetist for 34 years retiring in 1998. Charlene’s name appeared in the 1970 edition of Outstanding Young Women of America, being nominated by the Lewis Ladies Reading Circle. She also was nominated by a Great Bend Chapter of the WCTU to be a contestant in the B.P.W. (Professional Business Woman of the Year). She was a sponsor for a child in Viet Nam for several years. She was a member of the Kansas Nurses Association, American Association of Nurse Anesthetists, R.N.A. and the WCTU. She was also a member of the Christian Church in Great Bend and the Lewis United Methodist Church, Lewis. She held offices and played piano and organ when needed in each of the churches. Also a member of the vocal choir in UMC, Lewis. After retirement Charlene moved to the family home in Lewis and cared for her ailing mother until her death in 2001. One of her pleasures which most people that knew her, was her love of sending cards, letters and phone calls. Her confession to take Jesus Christ as her personal savior was given at an early age and was of great comfort to her all of her life and especially these last few months. Visitation is Sunday, Jan. 20 from 9 am to 7 pm at McKillip Memorial Funeral Home, Kinsley. Services are at 10:30 am on Mon. Jan. 21, 2019 at the Lewis Methodist Church with burial in Wayne Cemetery, Lewis. Memorials may be given to Youthville in care of the funeral home.